The SlimeGUARD Stick is placed in the sump area of your ice machine to keep your ice and your machine mold, mildew, and slime-free! After sanitizing, the SlimeGUARD Stick is placed in the sump of the ice machine. As the water circulates across this advanced media, it destroys and absorbs slime producing organisms. 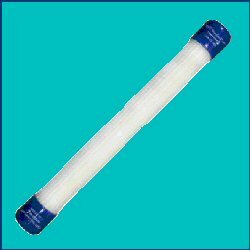 The SlimeGuardÂ® Stick continuously treats the sump water for UP TO 6 MONTHS. (Replace every 3-4 months in bread and pastry baking environments.) One stick will treat a machine producing up to 2,400 lbs. of ice per day. Buy by the case for an additional 5% Discount.